Yesterday artist Amy Sherald unveiled her portrait of former First Lady Michelle Obama for the National Portrait Galley. Reactions to the image have been mixed, with some unhappy about the image's cool color palette and Sherald's take on Mrs. Obama's likeness. Despite that, Sherald's explanation for her artistic choices demonstrates how deeply she considers every part of her work. 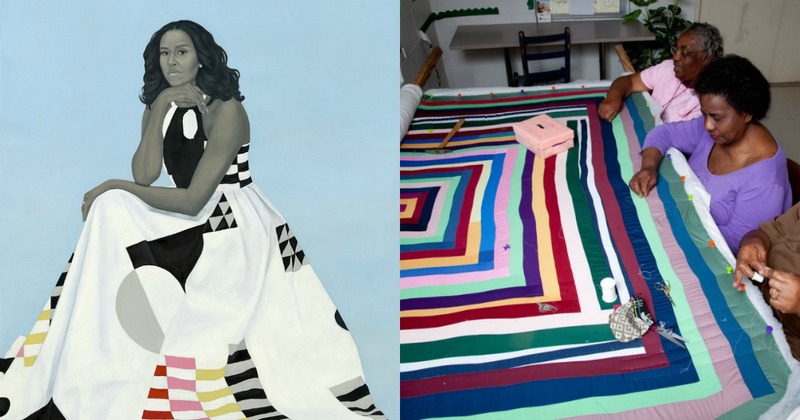 In an interview with NPR, she explained the decision to paint Mrs. Obama in the multi-colored dress seen in the portrait. But once I saw her in that one, I knew that that was the one that, you know, she needed to be frozen in time in. It has a connection to, you know, the art canon. But then it also speaks to black culture. 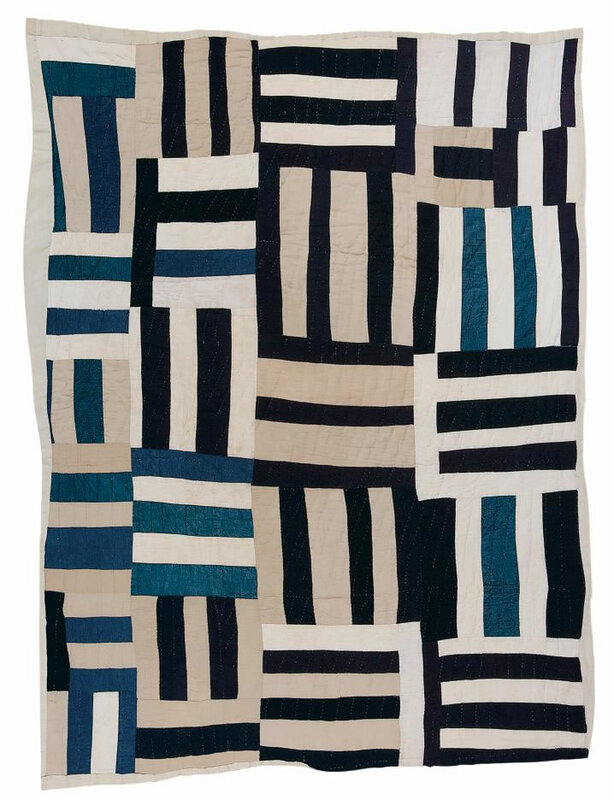 And it reminded me of the Gee's Bend quilts that women made over the course of their lifetimes and were discovered later on in life. 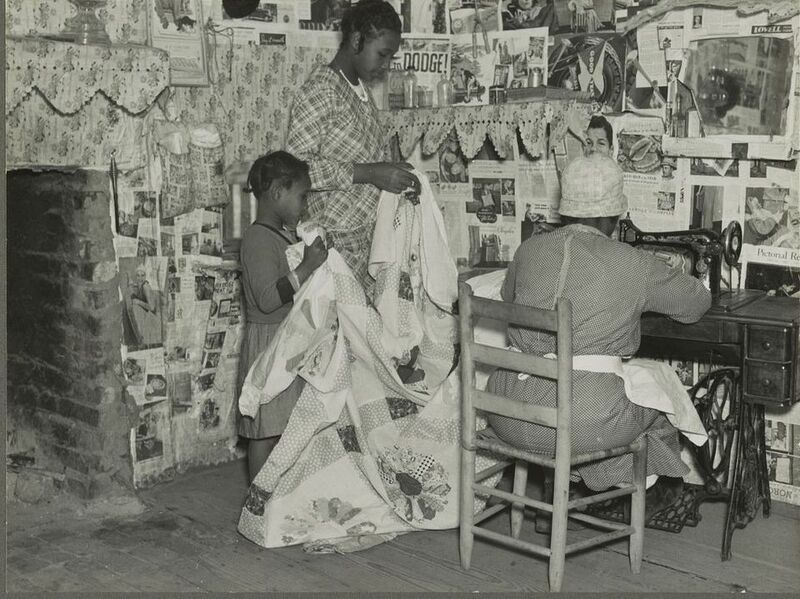 Here the artist refers to the quilters of Gee's Bend, Alabama. 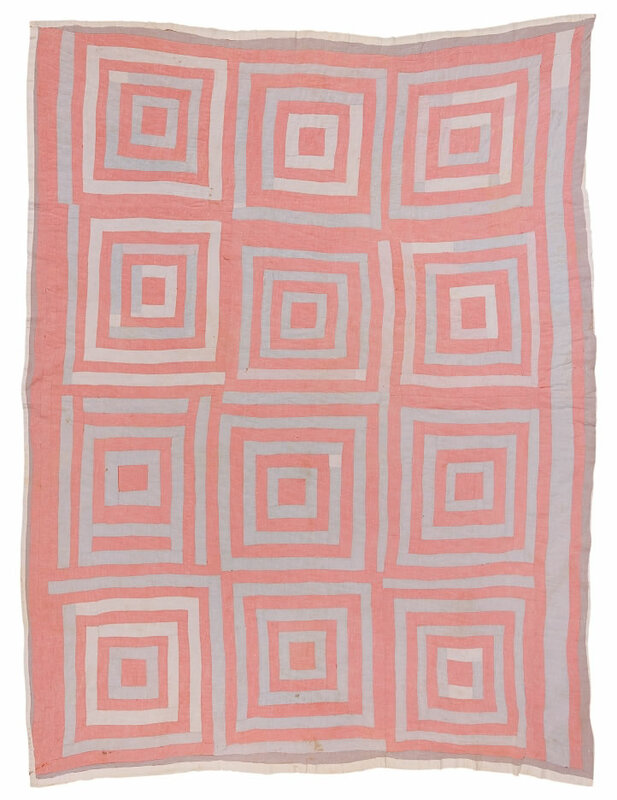 Since the early twentieth century, women of this tiny community, which was formerly a plantation, have crafted quilts with colorful patterns. 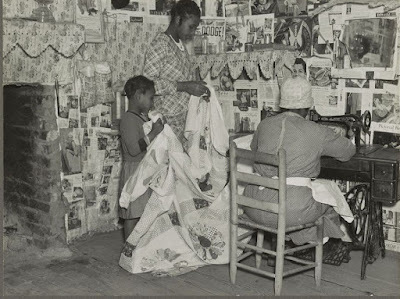 Gee's Bend quiltmaking in 1937. They began the practice out of necessity. During lean times, the quilts provided warmth. 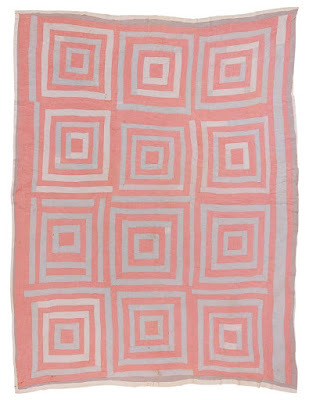 The artistic expression was innate, and the quilting has been passed down from generation to generation, and the distinct voice of each quilt-maker comes through in every piece. The quilts are now celebrated as important pieces of art and displayed around the country. Plummer Pettway 1918-1993 "Roman Stripes, variation (local name: "Crazy" Quilt) cotton twill, denim, cotton/ polyester blend, synthetic knit (pants matieral), 86 x 70 inches. Lucy T. Pettway, born 1921. 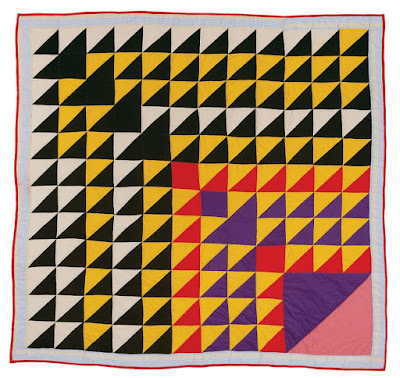 "Birds in the Air" (quiltmaker's name), 1981, cotton, cotton/polyester blend, 79 x 79 inches. 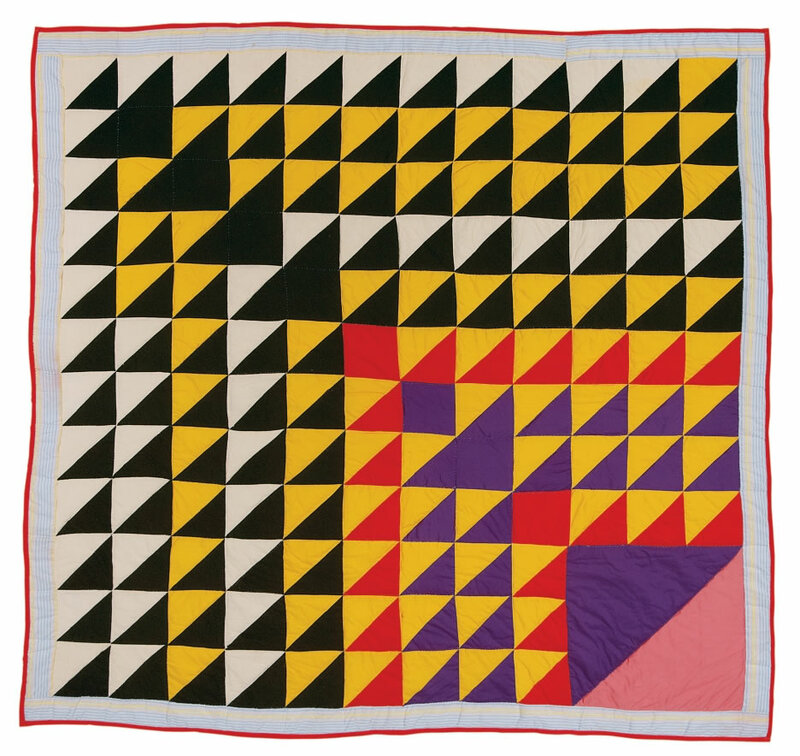 Though there is no longer an organized quiltmaking collective in Gee's Bend, the women's work continues to be celebrated in a variety of mediums, including commemorative stamps from the U.S. Postal Service.